There is nothing like a backsplash to add a little pizzazz to your kitchen. You can choose from a wide range of colors and patterns to fit your interior. However, the wide selection of backsplashes can be overwhelming. Use the following tips and ideas to enhance your kitchen with a beautiful backsplash. It’s easier to choose a kitchen backsplash when you narrow down your search. 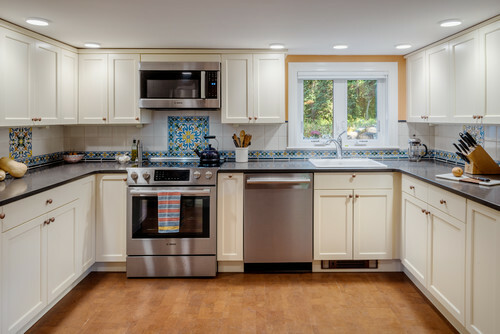 Here are several tips to help you choose your backsplash. Create A Visual: You can create a visual by placing store samples against the wall where your backsplash is going to be installed. Imagine each backsplash with your walls, counters, cabinetry and overall interior. You want to do this during the day and night to get a feel of each backsplash under any light. Color and Finish: The sky is the limit when you’re choosing the color and finish of different backsplashes. You can play it safe by sticking with neutral shades, or you can go bold with blue, teal or mint green. The finishes include glazed, unglazed, semi-gloss and high-gloss. The key is to figure out which colors and finishes work for your kitchen. Design of Tiles: You also need to take the shape and pattern into consideration, as this is what creates the design of your backsplash. There are tiles that create square, rectangle, round and ornamental patterns. Some tiles are arranged in a horizontal or diagonal pattern, and others are arranged in a straight line to keep it simple. Your Budget: Your budget is going to play a big role in the backsplash you choose for your kitchen. There are some tiles that are expensive, high-maintenance and time-consuming to install. Other tiles may be more affordable and easier to install and maintain. You can avoid spending additional money later by choosing durable tiles now. When you’re ready to choose your backsplash, here are several ideas for your kitchen. 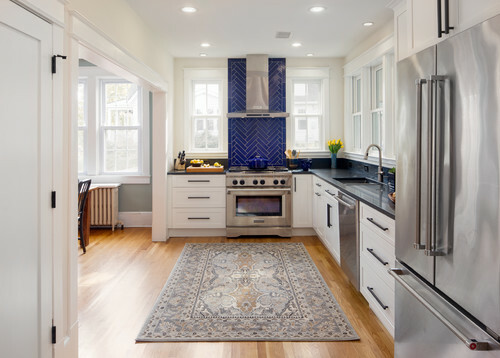 If you have a white kitchen with stainless steel appliances, then you can never go wrong with a dark blue backsplash. The white grout is a common solution for pulling the backsplash and interior together. 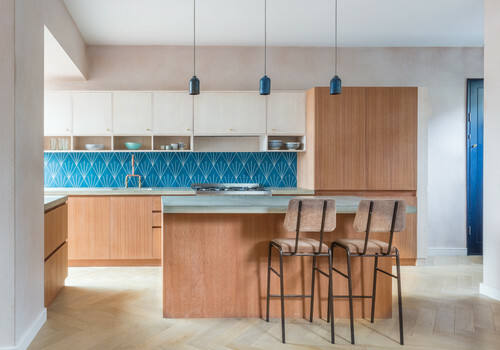 You can add a fun pattern by opting for herringbone tiles. Wooden elements, such as cabinetry and flooring, are great for creating a warm kitchen. You can use your backsplash to add a pop of color. One idea is to opt for a blue backsplash with white grout in a diamond pattern, as well as matching pendant lights, to give the eye a break from the warm tones. A colorful backsplash is sure to stand out in a white and gray kitchen. Invest in ceramic tiles in colors such as blue, yellow and white, and have them installed in an ornamental pattern. You can have one backsplash installed on your wall, or you can have smaller blocks of backsplash installed throughout your space. When you take your time and narrow down your search, you’re sure to find a backsplash that works for your kitchen.